alaTest has collected and analyzed 25 reviews of Sony BDPBX39 Blu-ray Disc Player - 1080p, HDMI, Built-in WiFi, Streaming Services, USB, HDMI Cable Included, Black. The average rating for this product is 4.6/5, compared to an average rating of 4.6/5 for other products in the same category for all reviews. We analyzed user and expert ratings, product age and more factors. 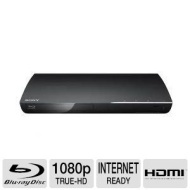 Compared to other products in the same category the Sony BDPBX39 Blu-ray Disc Player - 1080p, HDMI, Built-in WiFi, Streaming Services, USB, HDMI Cable Included, Black is awarded an overall alaScore™ of 80/100 = Very good quality. This was my second Sony Blu-ray player so I was familiar with the setup. Performance was a good deal slower than my other Sony which is an upper tier model. This device was about as expected from Sony. I bought one of these several months ago and ave very pleased with it. Bought this one for my sweetheart. Easy set up. Use it for Netflix DVDs and streaming. It has unleashed the quality of her HD TV. my second blue ray player. This one is internet enabled and provides support for internet movie services like netflix. It is slim so it fits in the cabinet easily. I bought this unit to go with my Bravia TV. Setup was easy and programming was a snap. All around the unit performances exceptionally well. The only problem I have is the lag when it boots up. If you have patients, then this is an ideal unit to buy! Easy to set up and plenty of features. Smaller than expected which is great. Very nice product. My only complaint is that it is a little slow starting up and loading a dvd or accessing Netflix. Setting up internet access was fine but did take longer than I had thought. Otherwise this is a great little player and a fantastic value.